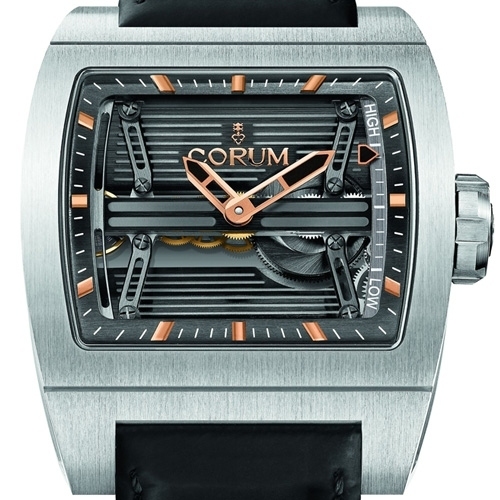 Confirming its commitment to research on Duchenne muscular dystrophy, Corum creates a one-of-a-kind version of the Ti-Bridge with linear 3-Day Power Reserveindicator for ONLY WATCH. This unique piece offered in a two-tone titanium and red gold case features an engraving of Asclepius and his snake-entwined staff, the symbol of medicine – an allegory celebrating the work of the Monaco Association against Muscular Dystrophy. Corum is associating with the 5th edition of the “ONLY WATCH” charity auction scheduled for September 28th 2013 in Monaco. Organized by the Monaco Association against Muscular Dystrophy, the auction will bring together around 40 watch brands and all profits will serve to fund research on Duchenne Muscular Dystrophy. In honor of this worthy cause, Corum is donating a unique Ti-Bridge 3-Day Power Reserve model combining appealing aesthetics and a top-flight mechanism. This timepiece beats to the rhythm of a horizontal inline baguette movement, patented by Corum and held by four cross-bars. The model redesigned on this occasion features a play on materials expressed in two-tone gold and titanium. While the upper surface of the case glows with the restrained elegance of grade 5 titanium, the sides are made from 5N 18K red gold, adorned with modeled engraving. The association of the two materials is eminently modern and makes a perfect match with the architectural codes of the watch. The applied logo and hour-markers are gilded, as are the hours and minutes hands and the power-reserve indicator, thereby creating a striking contrast with the anthracite grey dial. The engravings on the side of the case depict Asclepius, the Greek god of medicine, and the serpent twined around his staff that has become the symbol of medicine – a fine allegory and a paean of praise to the ONLY WATCH initiative. The engravings are entirely handcrafted using a time-honoured technique requiring meticulous artistry. The  process involves an extremely accurate set of gestures that begins with working on the reliefs so as to define the contours of the motifs. This operation is followed by high-precision line engraving performed using an instrument known as a scorper and serving to mark out the details of the motif, such as the veins of the leaves or the scales of the serpent. It is the latter operation that truly gives life to Asclepius’ face and makes this one-of-a-kind model a genuine work of art. The background is then reworked by hand using a chasing tool and a punch to achieve a regular matt effect, a texture that makes a delightful contrast with the shiny décor and thereby sets it off to full advantage. The Ti-Bridge 3-Day Power Reserve powered by Caliber CO107 displays the hours and minutes as well as a linear-type power-reserve indication. To achieve this, the movement is equipped with a satellite gear train that is visible when looking at the watch from the side along the 9 o’clock – 3 o’clock axis, but invisible when this Ti-Bridge is viewed from the front. This complication features several specific characteristics, including a differential system with three wheels of which one is off-centered and referred to as “planetary”. Depending on the rotation direction, the latter turns either on its own axis, or around that of the two other wheels, thereby connecting the barrel, the winding stem and the power reserve within a minimal space. This one-of-a-kind model comes on a rubber-look leather strap fitted with a titanium triple folding clasp complete with two safety pushers. The Ti-Bridge Power Reserve “ONLY WATCH” will be on show during the world tour of the ONLY WATCH exhibition starting September 6th 2013 and making stopovers in Singapore, Hong Kong, Shanghai, Beijing, New York and Geneva, before being presented at the Monaco Yacht Show from September 25th to 28th. The auction itself will take place on September 28th at 11 am in the Salon Belle Epoque of the Hermitage Hotel in Monaco, France.